A species much-maligned by conservationists, sycamore (Acer pseudoplatanus) has long been recognised by the timber trade in both Britain and Ireland as one of the most sought-after home grown hardwood species. This fact alone would surely justify efforts to improve its timber-producing potential. However, its importance as a forestry tree both by way of its wide distribution and silvicultural characteristics such as relatively undemanding site requirements and fast growth combine with its desirable timber qualities to make its inclusion in the British and Irish Hardwoods Improvement Programme (BIHIP) inevitable. To paraphrase the stated aims of BIHIP, the principal objective is to improve the quality of planting stock available to foresters and landowners and thereby improve the ultimate potential of those trees to produce the best quality timber and the best economic return. Species groups have been set up to develop and promote seven hardwood species which are commercially important, or potentially so, in Britain and Ireland. These are: ash, oak, silver birch, sweet chestnut, sycamore, walnut and wild cherry. To raise funds to help pay for the activities of the Sycamore Group. The search for outstanding trees is on! Because we plan to use these trees as the starting point in our improvement programme. Selected superior stands and the trees within any good stands will form the basis for breeding the future generations of improved sycamore – and we would like readers of this article to help ! We are looking for populations of reasonably straight, lightly branched trees; evidence of resistance to squirrel damage would be a bonus. Contact name, address and telephone number. Grid reference for the stand and directions. The age and size of the stand. Brief description of the surrounding area (i.e. whether there are other sycamore stands nearby). 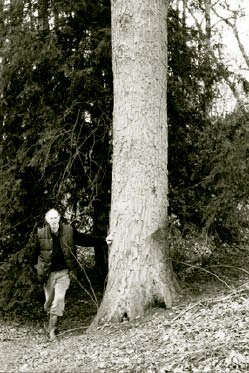 If possible, a photograph of a selected tree or the stand (this would give us a very good idea of the relative form of the stand). All submissions are welcome and will be acknowledged in due course. We intend to inspect all the stands notified to us, with a view to selecting the best of the best for the next stage of improvement work. Our selection criteria will be based on internationally recognised principles. We are in the process of evaluating a number of provenance trials set up by the FC and MAFF in the early 90s in England and Wales. Early indications are that there may already be significant differences between the performances of different provenances. Woodland Heritage have kindly provided start-up funding and pledged further support for our group. Andrew Clark, with contributions from members of the BIHIP Sycamore Group. There are over 60,000 hectares of sycamore across Ireland and Britain. The exact area is difficult to estimate, but it certainly represents a sizeable proportion of the total area of broadleaved woodland. This naturalised exotic has considerable economic potential as one of the fastest growing broadleaves and because it produces a desirable white-coloured timber with little discernible figure or grain. in addition some individual trees exhibit wavy grain timber, or “fiddleback”, which is prized for making musical instruments and for producing veneer. This is highly valued, and appears to be of genetic origin. The time of introduction of sycamore to these islands is uncertain. It is thought to have been introduced to Britain some time between the Roman occupation and 1550, although it has become established strongly only over the last 200 years. As a plantation tree it excels, being resistant to disease and rapid in growth, as well as showing reliable form once established – despite its tendency to fork when flowering, which can be managed through appropriate thinning. It is known for being more resistant to exposure than other broadleaves, principally due to its capacity to produce new shoots from dormant buds when terminal buds and shoots are damaged, which inevitably results in luxuriant canopy. Thus the edge trees in a plantation, although useless for timber, can protect those inside. Nursing mixtures with species such as larch or alder may be appropriate on less sheltered sites. In comparison with ash, sycamore is more frost hardy and generally less prone to forking in the establishment phase. The two species have much in common, such as light and soil requirements, and growth rates. Despite the similarities, however, it is generally acknowledged that mixtures of ash and sycamore are unsuccessful. Ash requires early and regular thinning to grow well, whereas sycamore benefits from delayed thinning in order to limit flowering and the associated forking. It is only on the best sites, typically sheltered with moist free draining soil, where the best timber will be produced. And the largest volumes of high quality timber will only result from properly managed stands, which have undergone timely formative shaping, high pruning, tending and thinning. Hopefully with improved planting stock from the Improvement Programme the input required on the first three of these operations will be markedly reduced. Details of this control method are available from Charles at Silvanus Services Ltd on 01566 772802.